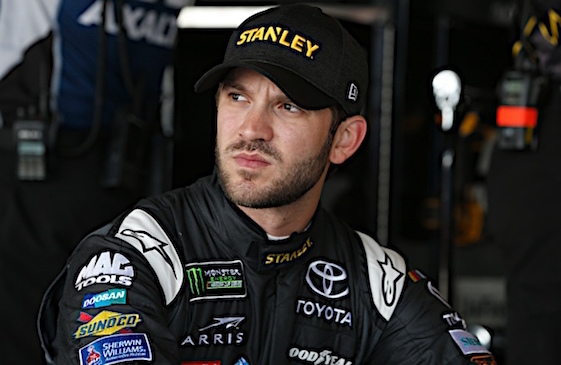 Daniel Suarez was awarded the pole for Sunday’s NASCAR Cup Series race at Pocono Speedway after the drivers with the two top qualifying speeds – Kevin Harvick and Kyle Busch – failed post-qualifying inspection. Harvick was fastest in the final round of qualifying, but his No. 4 Stewart-Haas Racing Ford did not pass the body scan portion post-qualifying inspection. Ditto for the No. 18 Joe Gibbs Racing Toyota of second-fastest qualifier Busch, but his car failed at the chassis station of the inspection process. Qualifying speeds for both Harvick and Busch were disallowed. Both will start from the rear of the 40-car field in Sunday’s 400-miler (2:30 p.m. ET, NBCSN, MRN, SiriusXM). The ruling elevated Suarez to a first-time pole winner in the Monster Energy Series. His speed of 176.988 mph in the Joe Gibbs Racing No. 19 Toyota stands as the pole-winning lap of record.